The Shoei RF line of helmets has become one of the most ubiquitous helmet styles in the world since their introduction in 1983. After decades of refinement, we find ourselves at the RF-1200, easily the most dialed in offering from Shoei, and a perennial favorite at RevZilla. New for Fall of 2016, Shoei has given the RF-1200 a new skin in the form of the “Flagger” graphic - perfect for the rider who was leaning towards a black helmet, but can’t quite bring themselves to pull the trigger on something so basic. 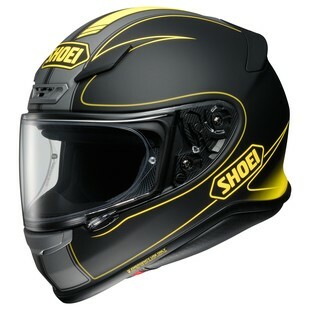 The Shoei FR-1200 Flagger Helmet is a mix of classic pinstriping and futuristic tech graphics. This would be perfect for the rider looking to coordinate their helmet with their motorcycle or gear. You get a splash of color in red, blue, or hi-viz depending on the flavor you prefer. Of course, the RF-1200 has not changed at all, only the graphic on the shell. You are still getting an ultra-premium, do-it-all helmet, coming in at a lightweight 3.5 pounds and still managing to satisfy the rigorous SNELL M2015 standard. Slim, aerodynamic, comfortable, well-ventilated, and as safe as you could ever hope for, the RF-1200 is a helmet I would never hesitate to trust with my life. Take advantage of this limited edition offering and pick up a “Flagger” graphic, an perfect blend of classic lines and cutting-edge style.